GREAT REVIEWS -- POLISHED COMFORT -- PERKS GALORE. Our Guest Cottage Was Built For Visiting Friends And Family. Best Of Maui's Resorts, Golf Courses, Beaches And Restaurants In Every Direction. You'll Have Easy Access To Lahaina And Kaanapali To The North Or To Wailea And Makena To The South. The Closest Beach To The Cottage Is About A Quarter Of A Mile Away. Our Cottage Enjoys Mountain Views And Cool Trade Winds.This Architect Designed Living Space Includes 20 Foot Cathedral Ceilings, A Unique Open Floor Plan With A Contemporary Kitchen And A Large Master Bedroom With An In Suite Jacuzzi. The Kitchen Has All Hard Wood Cabinetry And Brand New Appliances, With A Cook-Top Range, Microwave Oven, Ice Maker Refrigerator, Toaster,Blender,Coffee Maker,Brita Water Pitcher And Every Kitchen Utensil You Could Need,To Make Your Gourmet Dine At Home Nights A Breeze. The Master Bed Room Has A Super Comfy Queen Size Tempur Pedic Style Foam Bed With Crisp 100% High Thread Count Cotton Linens And Designer Coverlets.The Bedroom Has It's Own Mini Entertainment Center With A Wall Mounted 32' LED HD TV And Blu Ray Disc Player With A Collection Of Film Titles For Your Enjoyment Plus Streaming Netflix. For Music There Is An iPod Dock With FM Radio. The Master Bath Is Right Off The Bedroom And Has A Skylight For Natural Daylight And Soft Romantic Lighting For Night Time Enjoyment,The Corner Whirlpool With It's Clean White Ceramic Tiles, Red Towels And Candles Makes It Feel Like Valentines Day Every Day. 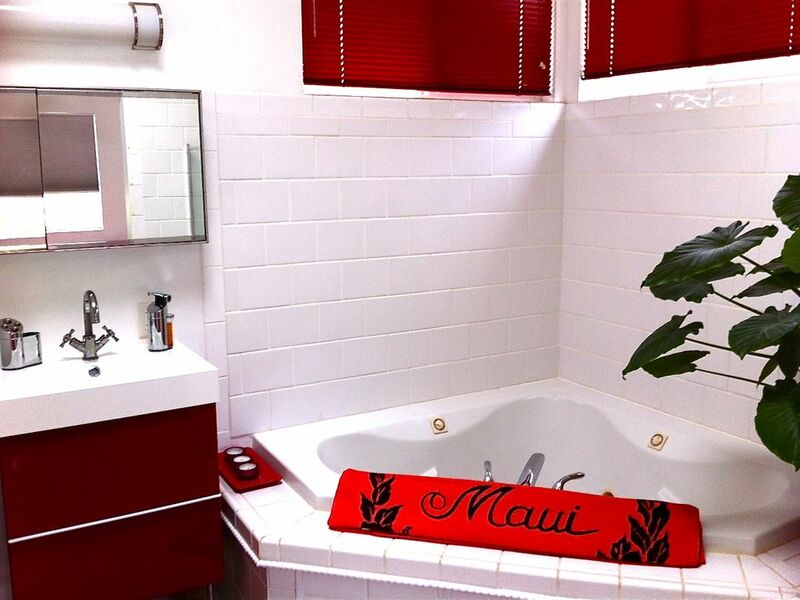 If You've Had A Hard Day Playing On Maui Then Jump Into The Custom Built Glass Brick Shower With It's Triple Shower Heads And Let It Relax, Soothe Or Refresh You. Enjoy Your Nights At The Garden Gazebo With It's Bubbling Hot Tub. Do Some Grilling At Your Gas Barbecue And Then Sit Outside Enjoying The Peaceful Dining Area. When You're Ready To Hit The Beach Grab Some Snorkel Gear Or A Couple Of Beach Towels And Chairs. We Have Plenty Of Gear For You To Take Along.Go Ahead And Enjoy Your Day In The Sun. If You're Headed Down' The Road To Hana' Or Want To Plan A Sunset Picnic On The Beach,Take The Cooler And Our Portable Weber Grill And Enjoy A Nice Barbecue Lunch Or Dinner. We Tried To Think Of Everything To Make Your Vacation More Fun And Even A Little Bit Less Expensive. Reserve This Quiet And Contemporary Cottage For Your Vacation And Enjoy A True 'Local Style' Visit With Your New Maui Family! We Look Forward To Hosting Your Visit. 'Maui No Ka Oi'....Maui Is the Best! This place is perfect! We loved the location in a quiet neighborhood near Kihei Road, near the grocery store, near the beach and park. The backyard is wonderful - nice grass, hot tub, bbq grill. The guest house is great - bed is super comfy with cushy pillow top, full kitchen with pots, pans and dishes all in excellent condition, whirlpool tub in bathroom, Ipod dock. We just can't say enough about how wonderfully perfect it was. We hope to return to Maui someday and will ABSOLUTELY stay here again. We've already recommended it to friends!! Thanks guys! Aloha, thank you for your interest in my home. I am a Maui resident for over 40+ years with a background in Resort Development. I have taken that attention to detail and brought it to my home and extended to my guests. SUNSETS - BEACHES - BIG BEACH - LITTLE BEACH - GOLF COURSES - FIVE STAR RESORTS - FINE DINING - CLEAR BLUE OCEAN - GENTLE WINTER SURF - HUMPBACK WHALES - GUEST AMENITIES EVERY WHERE ! The Red Hot Romantic Honeymoon Cottage With Private Jacuzzi Spa ... Perfect For Two ... Enough Said ! Ocean is 4 Blocks Away from Our House. Mature Landscaping, Bananas, Papayas And Fragrant Flowers In Our Fully Fenced Private Yard. My boyfriend and I got to stay 6 lovely nights in this wonderful little "oasis" of a ohana cottage. From the moment we got there, until we left, Jonathan was the best host we could ask for. He even helped us make our pizza (down to what and where to buy the supplies for it) and offered some of his own bits to add too! We came and went quite a bit, but it was always nice to come back to his beautiful grounds and very comfortable place. We used the gear provided, were bummed we never took out the bikes to ride around, but maybe next time! The kitchen was outfitted with everything we need to make our own meals. It was great to have a washer and dryer. I used the hot tub the night that we arrived and what a blessing to have it after a long day of travel. I also used the whirlpool spa tub and it was so relaxing! There are 2 big windows in the bedroom that we opened up every night to let the wonderful breeze in with. I really didn't want to leave, but would not hesitate to book this spot again if we do visit Maui anytime in the near future. Thank you Jonathan for everything! You've got a great spot, keep up the good work! We had a wonderful time staying at Jon's Honeymoon cottage! Jon was a great host and very helpful and ready to assist if you need anything at all. The room is beautiful and very comfortable, very well equipped kitchen and bathroom with lots of basics already in the cupboards. Although in the high eighties while we were there we didn't need to use the air conditioning due to the amount of windows and cross ventilation. He has an impressive array of amenities available, boards, bikes, snorkel gear, nice backyard with chairs for relaxing with great barbecue facilities and pizza oven! Quiet location in a cul de sac with assigned parking, lots to see and do within walking distance. Would highly recommend for couples looking for a nice quiet place to come back to at the end of the day, and soak in the huge Jacuzzi tub! This VRBO is better than described. The beach, shops, and restaurants are within walking distance and the sunsets are beautiful. My husband and I enjoyed the back yard hot tub in the evening and had coffee in the morning on the lounge chairs before our adventures. Jonathan was a great host. He answered any questions we had and was very accomidating. Everything you need is there including snorkel gear, bikes, coffee maker, and even yoga mats. If you are hesitant about booking a VRBO, ask your host about the nanny cam detector which made us feel extra comfortable. Would definitely stay here again, well worth the price! i'm so glad that you two had a terrific honeymoon staying with us. We loved our stay. Very clean and comfortable place. It had everything we needed and more. Jonathan was super friendly and helpful, he gave us great tips on places to check out. We loved being close to all the nice beaches but tucked back in a quiet neighborhood. We would absolutely stay here again. thank you both for a great review,next year bring the whole family back and book both of our properties. feel better and come see us again soon. Loved it!!! My wife and I had a pleasure of staying at this this “home away from home”. There’s a reason this place has so many positive reviews. House is 8 min walk (2 min drive) from the beach, in a quiet cul de sac and away from busy hotels! There are enough tourists on this island, staying here was our escape from the chaos. Inside the unit was a fully equipped kitchen, with spices, cooking oils, bbq sauces, juice blender, coffee maker, pots and pans - let’s just say if you want to cook on your vacation, you’ll only need to worry about buying food. The unit also had spacious living room with 2 couches, Amazon Alexa, and humidifier with a couple oils. Bedroom had a closet, night stands, TV with a Blue Ray movie collection. Tempurpedic bed was very comfortable, covered with soft linens. In the mornings, you hear birds sing outside – how peaceful! Bathroom cabinet had to name a few: shaving cream, razors, band aids, aspirin, q tips and even Tampax - that’s just level of detail & going above and beyond that Jonathan provided. Bathroom also had a bathtub jacuzzi – large enough for 2 adults. We had a very comfortable, quiet and relaxing time here. I think Jonathan truly put his heart and soul into making guests feel at home. We would definitely stay here again! Thank you Jonathan for making this a memorable trip and we miss your lamb chops! Would do it again! Too bad there was construction going on all around us. Otherwise terrific! Jonathan provided all the toys for playing at the beach. Everything. He even bought two new surfboards! Full kitchen. A/C. (which we didn't need) An extremely helpful Maui guidebook. Easy parking. Beautiful backyard facilities: hot tub, grill, washer/dryer, even a pizza oven. A week stay wasn't quite long enough. Go for at least 10 days. We can't wait to do this again! Sounds like you really loved our property, Sorry about the county paving our road. It was noisy for a bit but it's all back to being quiet. Happy that you liked our place ... !